WTAPS has been using military history and culture to dictate the direction of their collections since the brand’s inception. A new subline from WTAPS focuses on stripping away the branding and presenting a more minimal take on the genre. Mill is focused around military uniforms and bringing a streamlined take on military uniforms. The SS19 Mil (UNIFORMS) capsule sees WTAPS strip back to the bare necessities of workwear, delivering “the ultimate uniform line” thanks to simplistic, oversized cuts and minimal tailoring. 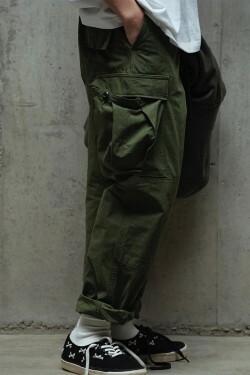 The capsule is comprised of a M-65 field jacket, a ripstop jungle BDU shirt, cargo pants, ripstop jungle pants and a pair of simplified cotton-satin mix trousers. Available on the WATPS site now. For more WTAPS hit online, look to retailers like SJS.